In my last blog post, I told you about my new year’s resolutions, visit more gardens, grow more flowers, improve my photography, and learn how to arrange flowers. I haven’t visited any gardens yet, but I have ordered new dahlia tubers! I was partly happy with the varieties I grew last year, and will grow some of them again. The dahlias that turned out less useful for cutting, short-stemmed or with less sturdy stems, won’t make their appearance again. I have given the tubers to a friend who volunteers at a nearby community garden, so I can still visit them. With so many forms and colours to choose from, it’s easy to spend hours on the internet looking for gorgeous dahlias that make the best cut flowers. Now you understand why I don’t have time to blog? I won some seeds on Julies blog, ammi majus, honeywort and salvia and I am shopping for sweet pea seeds. I have also been taking lots of photographs. I really enjoy it, and I try to take photographs every day. I am still looking for a good floral design class, though. It’s not easy. I love garden inspired bouquets, with ferns, greens and foraged branches. Floral arrangements with a wild, romantic look. 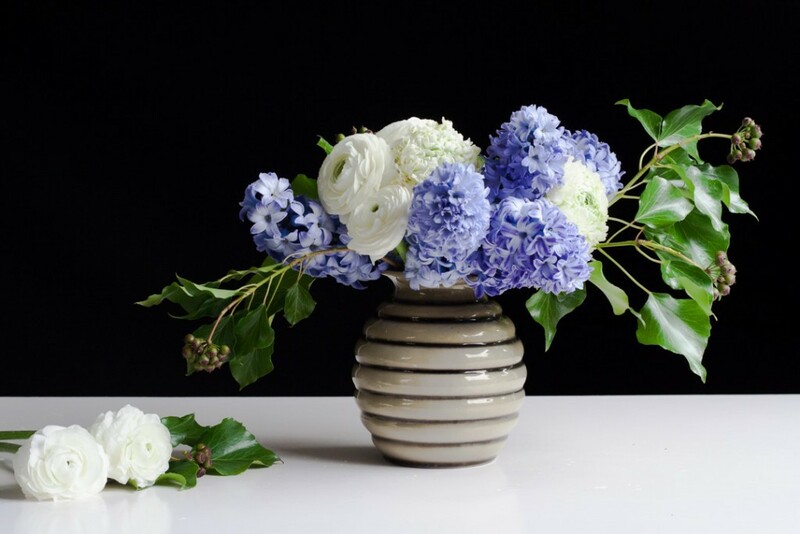 I haven’t come across a floral design school that teaches this style of arranging yet. The examples I have seen look too stiff and unnatural. 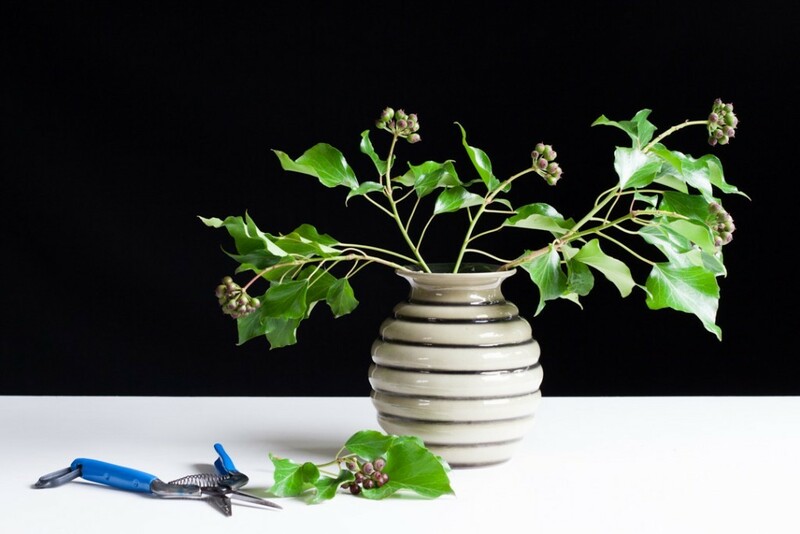 But I am sure I will find a workshop I like, and in the meantime, I will practice flower arranging at home. 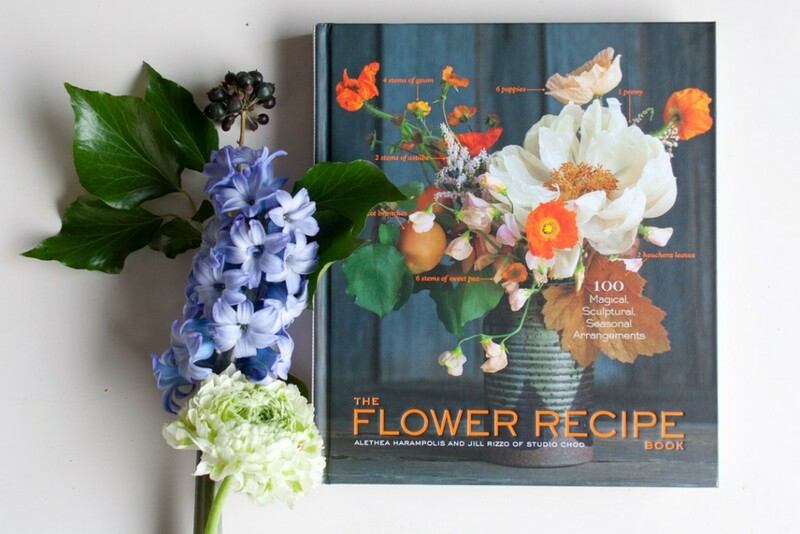 My favourite Christmas present was The Flower Recipe Book by Alethea Harampolis and Jill Rizzo of Studio Choo. 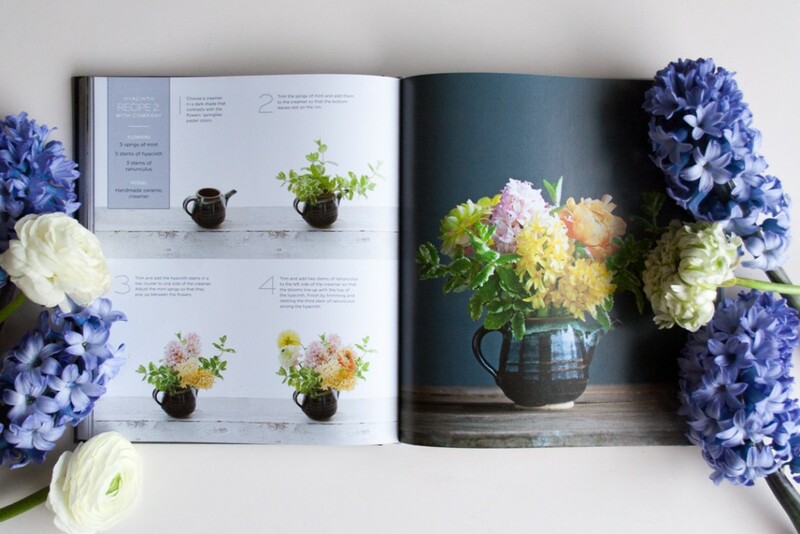 It’s a beautifully illustrated and practical guide to flower arranging. 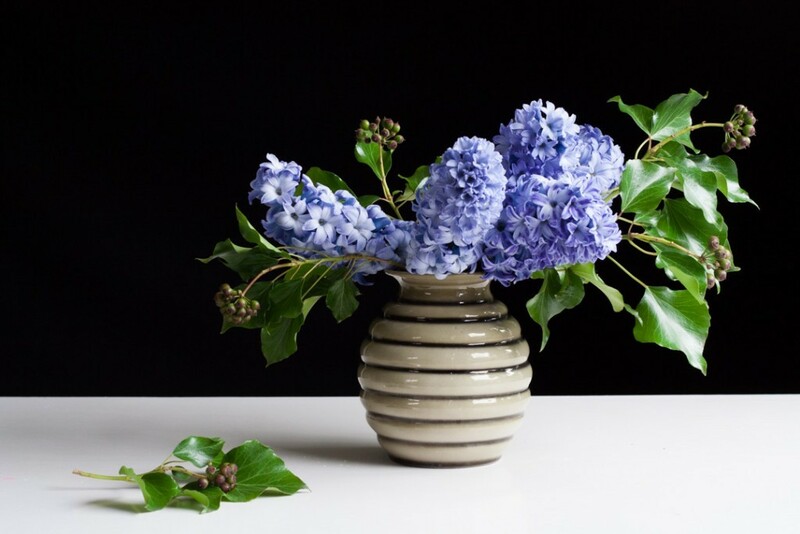 Studio Choo is a San Francisco-based floral design studio that creates wild and sculptural flower arrangements, just the way I like it. The Flower Recipe book was published in 2013 and is the no. 1 bestseller in ‘flowers and gardening’ on Amazon, so you may already be familiar with it. If not, I can highly recommend it. The photographs are beautiful and even if you never make an arrangement, it’s a lovely read and a gorgeous coffee table book. 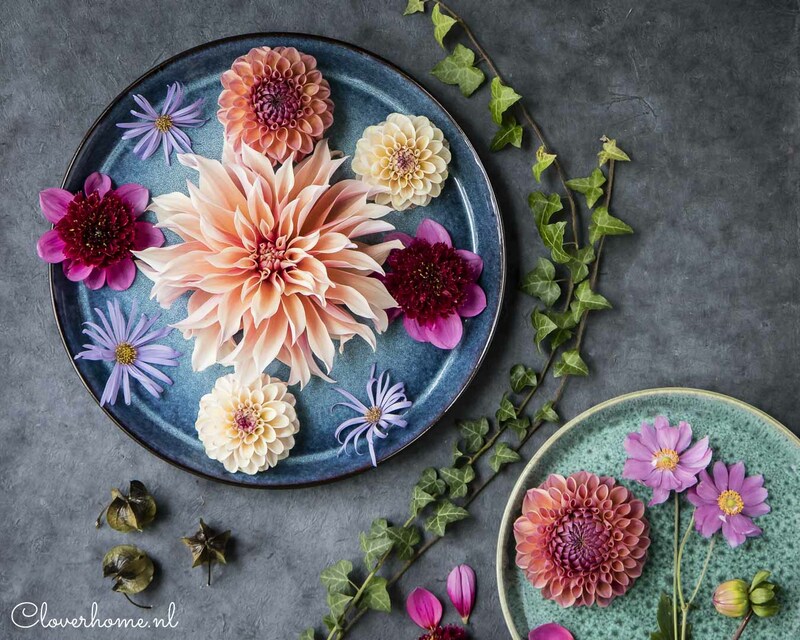 The book features 43 flowers in alphabetical order, from allium to zinnia, and more than 100 how-to’s for arrangements created with these flowers. Arrangements can be made of just a single flower variety or a number of different flowers. As in a cookbook, each flower recipe provides an ingredients list, which blooms and how many, and step-by-step instructions. I love the style of arrangements in this book, they encourage you to experiment with lots of different combinations. The inspiration comes from combining unusual materials with a few flowers to create a natural, garden-style bouquet. I have never used herbs before, but I love the idea of adding fragrance to an arrangement. Just a small critique, they are known for their seasonal arrangements and they prefer to use flowers that are locally grown and in season. But the recipe for a tulip arrangement includes amaryllis and dahlias. Spring, winter and autumn in one arrangement. Another thing, but this is personal, I don’t like the use of succulents in bouquets. Now on with the arrangement. I first tried my hand at making a proper floral arrangement using dahlias from my cutting garden. Obviously, there are no dahlias at the moment. Can you believe the only thing blooming in the garden right now are hellebores? I must add some more winter flowering plants. If you have any suggestions, please leave them in the comments. Choose a vessel, the book suggests using a creamer in a dark shade that contrasts with the flowers’ springlike pastel colours. I used a vintage ceramic vase. Trim the greens and add them to the vessel so that the bottom leaves rest on the rim. I could have stopped right here, don’t you just love the glossy ivy leaves? Remove all leaves from the hyacinths. 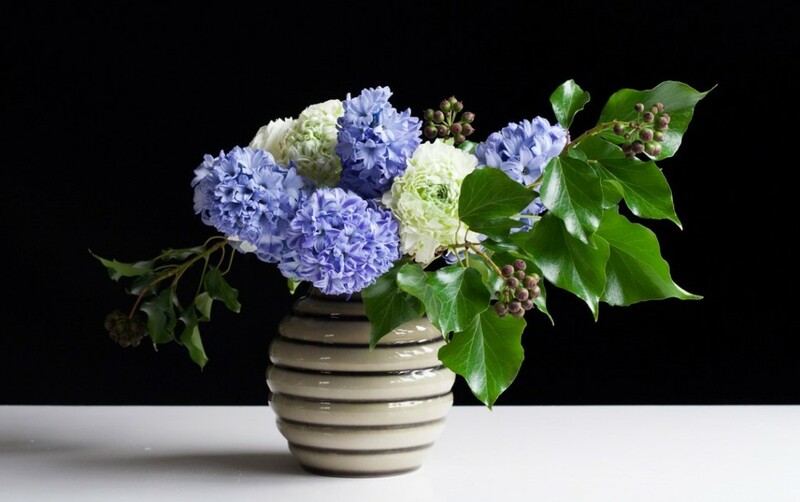 Trim and add the hyacinth stems in a low cluster to one side of the vessel. 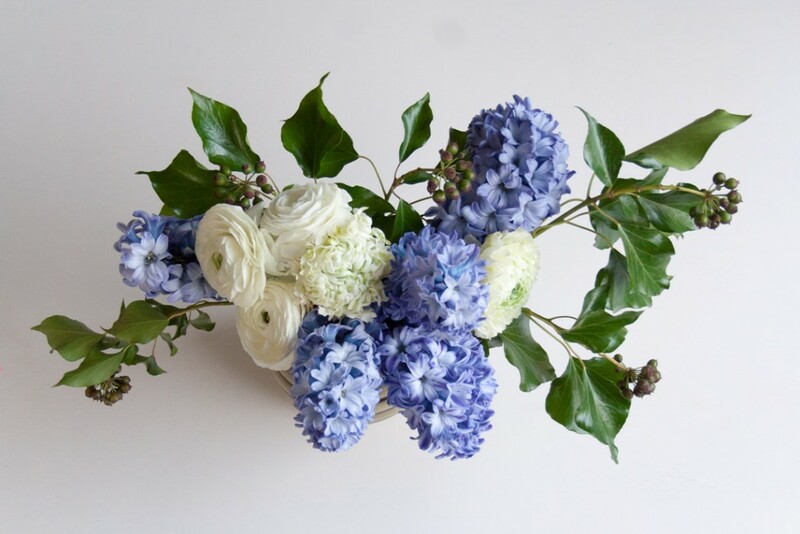 Trim and add four stems of ranunculus to the left side of the vessel so that the blooms line up with the top of the hyacinth. Finish by trimming and nestling the other stem of ranunculus among the hyacinths. I was really pleased with the way it turned out, what do you think? 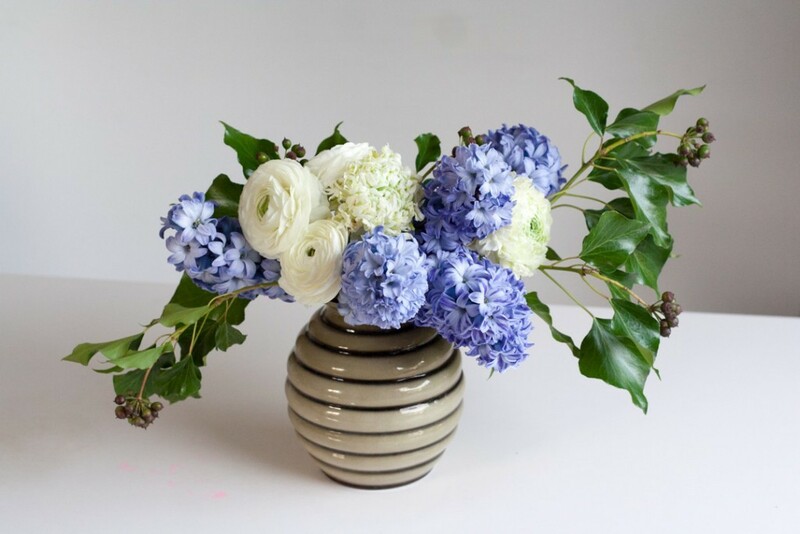 Do you make your own flower arrangements? Where do you get your inspiration, and is this book something for you? This link is an affiliate link. Any purchases will help support this blog. Thank you for that! Mooi! Ben benieuwd naar volgende creaties. Het is een prachtig boek, erg leuk om inspiratie uit op te doen. Ik ga er zeker nog meer uit maken! Well hello Pauline! I love your bouquet – and of course your photos are stunning. This book looks very interesting – I think I’ll see if my public library has a copy. I’m with you – I like this more wild or natural arrangement style. Good luck finding a flower arranging class! Thank you, June! I hope you enjoy the book as much as I do, let me know. I would love to see any arrangement you make. Have a good weekend! Hello Pauline, I really love to see your flower arranging skills to bloom. I didn´t know the book so far, so thank you for the recommendation. Always good to learn something new! Last year you inspired me to grow sweet peas and this year I will go for another try. 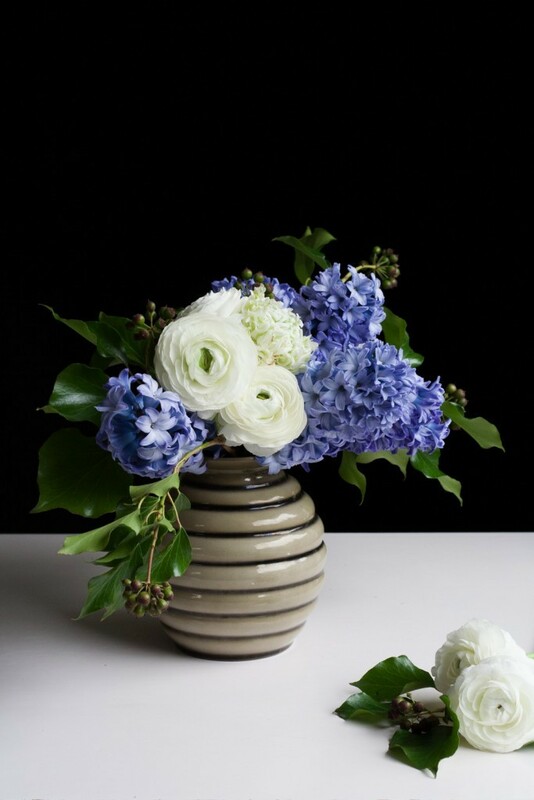 As always I love your flower photos, and if I read something about a flower arranging class I will let you know! 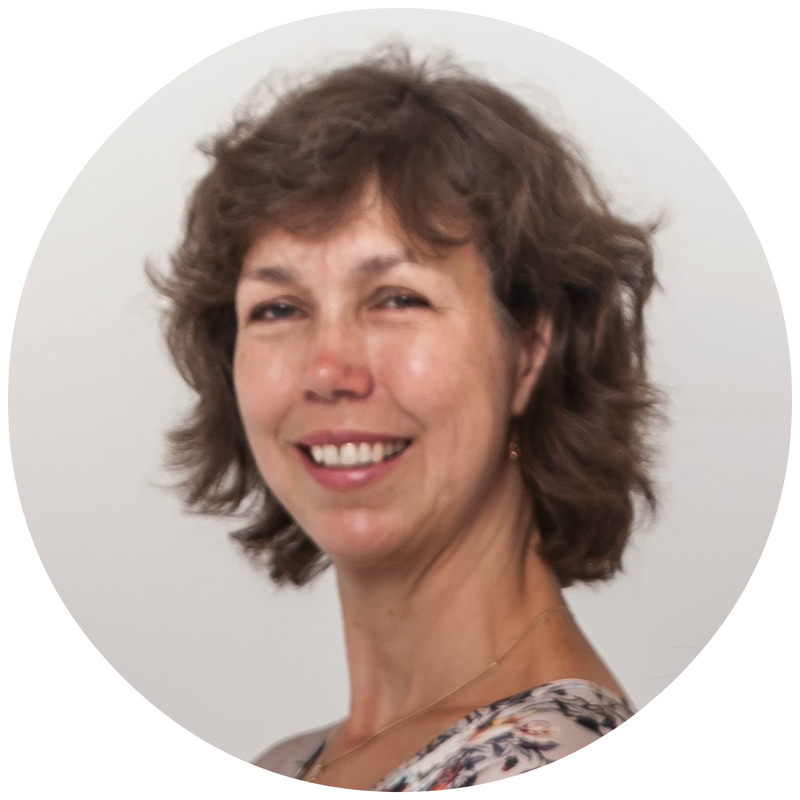 Hi Silke! So good to hear you are growing sweet peas again. Last year, my sweet peas were a complete failure. The day after I put them into the garden we had hail and they never really recovered. But ofcourse I am growing sweet peas again this year. 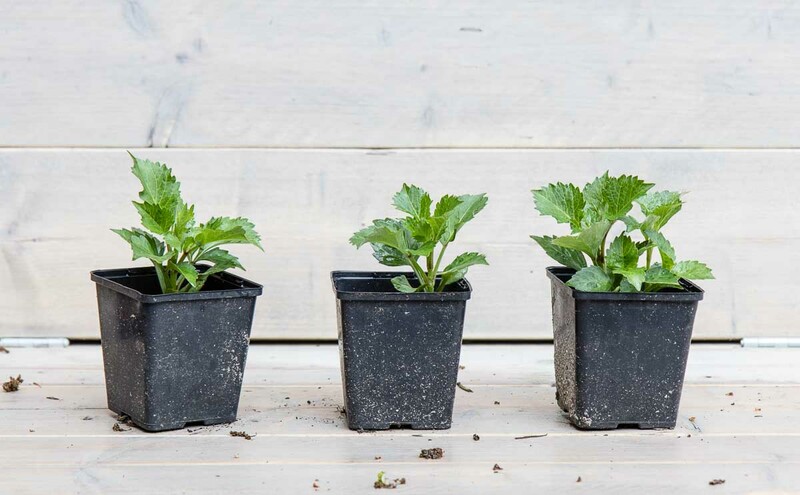 Gardening is as much about anticipation as about results. I love searching the internet, looking at different varieties, choosing seeds, don’t you? Gorgeous. Shame about the Dahlias though…Looking fwd to seeing what beautiful Dahlias you grow in the coming season. Thanks, Elisha! I have ordered some anemone dahlias, I didn’t have those yet. I also ordered more pink ones, I had too much orange and red in my cutting garden. How are your dahlias doing?